Were you at Singapore Indoor Stadium last 14 & 15 June 2013 attending Mayday 五月天 Nowhere 諾亞方舟 (明日版) concert? Can’t get enough of the high concert and all the 经典，琅琅上口 songs by Mayday 五月天? They are back to Singapore with Mayday 五月天 NOWHERE 诺亚方舟 3D Movie! Psst! I have watched this 3D movie at a private screening event yesterday with my friends and Mayday Fans! I still can’t get enough of it! It’s really awesome! You will definitely sing along with Mayday throughout the whole movie. 3D effects was amazing as well, it’s like you are sitting on VIP seats watching 阿信 Ashin, 怪兽Monster, 石头Stone, 瑪莎 Masa & 冠佑 Guanyou performing right in front of you! 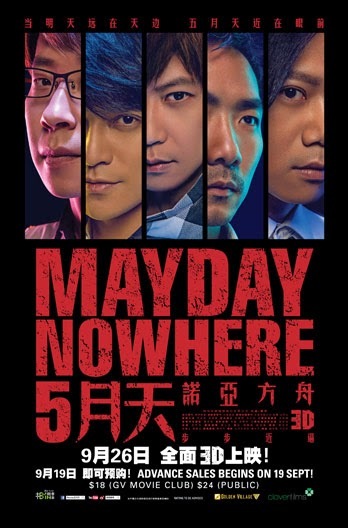 Now here’s your chance to catch the latest Mayday 五月天 NOWHERE 诺亚方舟 concert movie on its opening weekend? I have a SPECIAL PROMO for YOU!! To receive the freebies promo, you MUST purchase tickets for this stated screening session only. On 29 September itself, present your purchased tickets at the redemption booth near GV Jurong Point Box Office between 1pm to 1:45pm to redeem the free popcorn and ice cream. P.S: When redeeming the promo items, remember to tell the redemption crew that you’re my supporter (Yan Teng – tebisha.com), cos if I get the most number of friends/fans/followers who attend the screening, then each of my supporters will also receive one complimentary movie pass for your next visit! ** I will be there watching this movie again! So join me!